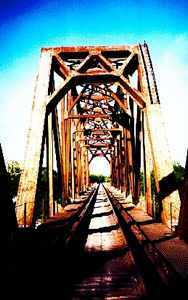 The town dates from 1870 and the Galveston, Harrisburg and San Antonio Railway arrived in 1876. Although the stop was named Hilda (there was also a Hilda in Gillespie County) it was renamed McQueeney, "in honor" of the superintendent of the Southern Pacific line. Actually it was a transparent ploy by storekeeper C. F. Blumberg to persuade the railroad to move the stop from Hilda to his store a mile away. The railroad didn't move - but when the post office opened (1900) it retained the name. By 1914 McQueeney had forty citizens. How people know the bridge was built in 1899. Lake McQueeney, AKA Lake Abbott, was formed by damming the Guadalupe River in 1925. It soon became a popular recreation area. Throughout the 1940s McQueeney had a population of 300 residents which has since increased to the present 2,500.